STORRS - UConn coach Geno Auriemma is a bit bemused by what seems like a renewed sense of enthusiasm in the Huskies fan base. 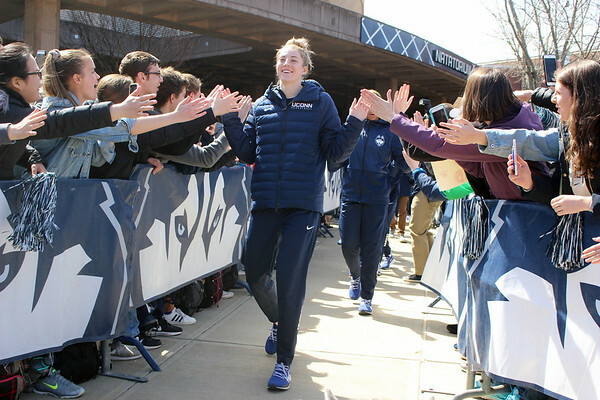 Hundreds of supporters, some lined up three or four deep behind barriers, waited almost an hour outside Gampel Pavilion on Tuesday to cheer the team as it headed out to the program’s record 20th Final Four. UConn faces rival Notre Dame in the national semifinal on Friday night in Tampa, Florida. Christine Kipp, 42, of Dayville, Connecticut, brought her three children to the rally. She said it’s been the most exciting UConn women’s basketball season in years. The Huskies are making a 12th straight trip to the national semifinals. They’re aiming to extend another record by winning a 12th national championship and first since winning their fourth straight in 2016. But this season hasn’t been as easy as some. UConn (35-2) lost two regular-season games for the first time since 2012-13, trailed in several others games and got a No. 2 seed in its regional. That hasn’t happened since 2006. The Irish beat the Huskies 91-89 in last year’s Final Four on a dramatic buzzer-beater in overtime and went on to win their second title. UConn won a regular-season rematch, 89-71, in December in South Bend, Indiana. The programs have played six times in the Final Four since 2011, splitting the meetings. Bill Salvatore, 70, of Vernon, was in the stands for last year’s loss. He’ll watch from his couch this year, but came out to let the Huskies know the fans will be with them win or lose. Posted in Newington Town Crier, UConn on Tuesday, 2 April 2019 21:26. Updated: Tuesday, 2 April 2019 21:28.